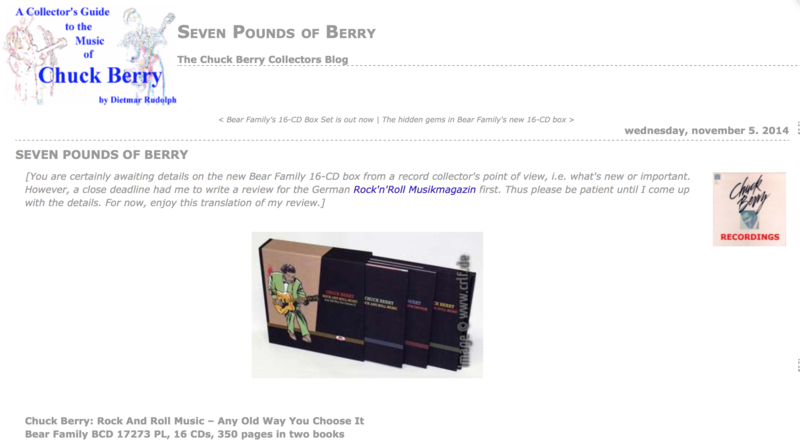 Collectors of our kind of music already know: When Bear Family takes care of one of our favorite artists, you can purchase the result without any doubt, no matter if they cover Bill Haley, Jerry Lee Lewis, Carl Perkins, or as here Chuck Berry. So why write a review then? Because there are collectors who think more than twice when a box comes with a price tag of 300 Euros (or $400). So what do you get for the money? One thing you will get is simply everything, no less than the total musical works of Chuck Berry. Just turned 88, this pioneer of rock music in the 1950s, 1960s, and 1970s worked for the labels Chess, Mercury, and Atco. During these times more than 300 studio recordings originated. And all of them are in this box. The Chess recordings had been reissued in 2008 to 2010 by Hip-O Select, a sub-label of Universal Music. Likewise the Atco recordings are available on CD. But here we also get the Mercury recordings (1966 to 1969). While there had been a CD reissue in the 1980s, those were pressed in very little quantity and are extremely hard to find. Which is a pity because also in the late 1960s Berry recorded several interesting songs. One highlight are the tracks recorded in Memphis together with a set of musicians who later performed with Elvis on numbers such as In The Ghetto or Suspicious Minds. So we get Berry's complete studio work including his Mercury period. Which makes up for a total of 11 CDs. These CDs have been compiled in a way that every Rock'n'Roll fan may want to listen to an arbitrary one without getting bored. This is in contrast to the Hip-O Select sets which got lost in alternative takes presenting multiple versions of the same song in sequence often. With this Bear Family Box, there is only one version each, the most well-known variant. Only with a small selection you may find a second variant hidden on a different CD, e.g. where the hit version had been highly modified against the original album version. 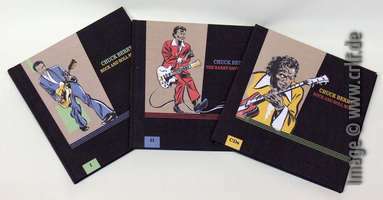 In addition to the complete studio history of Berry, five further CDs show an interesting comparison: a cross section through his live performances of that time. This starts with segments from an Alan Freed show in 1956 and ends with the stage recordings made for the Alan-Freed-Memorial movie "American Hot Wax" in 1977. Included are several recordings which had been available before only on rarest vinyl or not at all. Bear Family would not Bear Family, though, if these twenty hours of music weren't accompanied by writings at least as interesting. And therefore this box does not only come with one album-sized book, it comes with two! The main book was written by three authors, each of whom having written one or more books on Chuck Berry already. Bruce Pegg not only tells Berry's story on more than 100 pages, he also describes the circumstances of recording sessions and the origins of the songs. Fred Rothwell, who also acted as a producer for this box, added more than 30 pages of discography listing in detail each and every recording, musician, and important release. Morten Reff as the second producer not only made sure that in this collection all those tracks are found which had been missing on CD before. He also opens his archive of international record covers for us. Due to this you not only find all the US covers displayed, but also the most beautiful records from all over the world, ranging from South Africa to New Zealand - of course in full color and best quality. Next to these there are approximately 1.000 photos: views into the recording studios, performances world-wide, concert posters, advertisements and so on. Many of these photos can be seen here for the first time, or at least for the first time in this outstanding quality.